Bed bugs infest homes, group residences, hotels and other places where people sleep, rest or sit for long periods. Bed bugs are oval brown insects between 1/4" and 3/8" long – about the size of an apple seed. Their bodies are flat, allowing them to hide in seams, cracks and crevices of mattresses, walls, furniture. Like ticks and mosquitoes, bed bugs feed on human blood. Clearing a residence of bed bugs requires a professional pest control service. The head and neck are typical places for bed bugs to bite, but they will also bite bare arms and legs, or any exposed skin. Sensitivity to bed bug bites varies; some people may show only a small red bump, while bites in others can cause swelling, inflammation or rash. Bed bugs are not known to transmit diseases to humans. Common household pesticides are not effective against bed bugs. Bedbugs will not respond to insecticides designed for other types of insects such as fleas or ticks. Renters: Notify your landlord of bed bug conditions. Property owners: Contact a professional exterminator with experience in the special requirements of bed bug control. 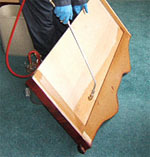 Effective bed bug control involves removal, disassembly and cleaning of furniture along with proper application of specialized products to kill both bed bugs and their eggs. Consult a professional exterminator with experience in bed bug control. Check used furniture, mattresses, box springs, or bed frames for bed bugs before you bring them into your home. When you return home from travel, do not place luggage, purses or bags on beds, couches, or other areas where you rest or sleep. Check your belongings for bed bugs first, and store luggage outside the house in a garage or attic. If you think you bed bugs on personal items, immediately wash and dry your clothing on the hottest setting the fabric can withstand for 20 minutes, or store them in a sealed plastic bag until you are able to do so. In your apartment, seal cracks and crevices around plumbing and wiring, this will help prevent bed bugs entering from neighboring apartments. The Mississippi State Department of Health does not investigate or remove bed bugs from private residences, rental properties, apartments, or hotels. We do investigate reports of bed bugs at child care facilities, nursing homes, personal care homes, and other types of licensed care facilities that we regulate. Contact our Environmental Health office below for assistance in these cases. For more information on bed bug detection and control, call the MSDH Office of Environmental Health at 601-576-7690.